Bullies tend to bully others anyplace where adult supervision is low. This means the playground, the Internet, the cafeteria, school hallways, restrooms, and school locker rooms are prime bullying hot spots. Even school buses provide an environment where bullying thrives. After all, bullies have a small space, a captive audience and a bus driver whose focus is on the road. Add to that the contained environment, a ride that can last up to 30 minutes or longer, and very little supervision and you can see why buses are one of the top places where bullying takes place. To make matters worse, it is impossible for victims of bullying to walk away from a bully on the bus. This fact can leave a target of bullying feeling trapped and helpless. And because victims of bullying often have no choice but to ride the bus this makes them easy and regular targets of bullies. Plus, with the close quarters, other students can easily be drawn into the bullying either by succumbing to peer pressure and participating or by becoming victims themselves. What's more, when bullying occurs on the bus, it is not left on the bus steps when students arrive at school. Starting the school day on the receiving end of aggression, or even as the one being aggressive, these actions filter into the classroom. It also can cause victims to fear going to school and force them to focus on the intimidation they are experiencing rather than on learning. As a result, bus bullying may lead to absenteeism, dropping grades and poor concentration in class. Even bystanders suffer effects from bullying on the bus. Not only do they worry about becoming the next target, but also watching another person be bullied can have a lasting impact. So, what should be done to make the bus ride bully-free? Ensuring a safe ride to and from school is up to the students on the bus, their parents, the bus driver, the bus company, and the school. 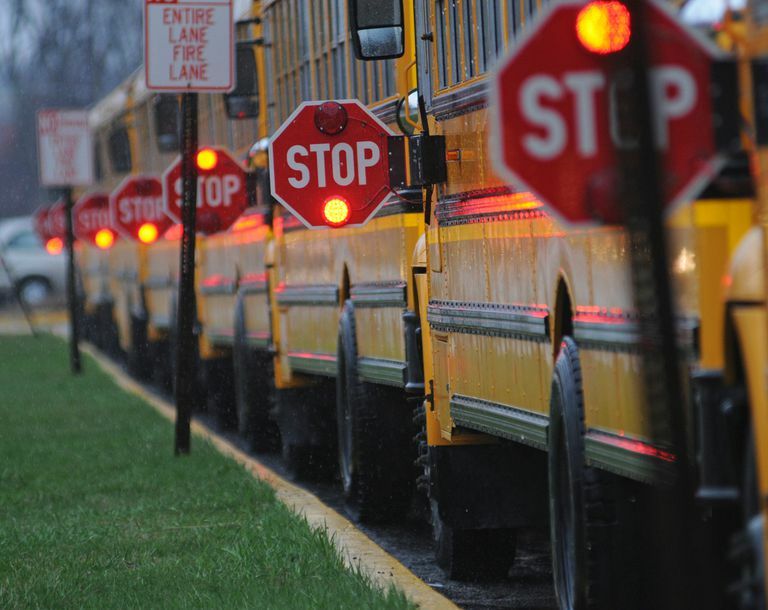 First, students should practice responsible bus riding behavior. This means sitting facing forward, talking quietly and being respectful to the driver and the other students. For students concerned about bullying, they should sit as close to the bus driver as possible and on the right-hand side of the bus so that they are visible to the driver. They also should consider pairing up with neighborhood friends and riding the bus together. It’s also a good idea for kids to have ideas on how to respond to a bully before it happens. They can practice using humor, ignoring the bully or telling the bully to stop in a firm voice. If they do experience bullying, it’s important that students report the behavior to an adult such as the bus driver, a parent, a teacher, a guidance counselor or even the principal. Kids also should know what to do if they witness bullying. Standing up for a friend can go a long way in preventing future bullying incidents. As for parents, it’s important that you know the signs of bullying. A lot of times kids who are bullied don’t tell anyone what is happening to them. As a result, if your child is anxious about getting on the bus or talks about kids messing with them, these are signs that something is going on. It’s always a good idea to dig a little deeper and find out if your child is being bullied. If your child does share something, be a good listener and make a commitment to help resolve the situation. Avoid blaming your child for the bullying but instead come up with ideas to help your child overcome bullying. Parents also should be aware of the school’s bullying prevention policies including how the school handles bullying on the bus. Become familiar with this information before you have to handle a bullying situation so that you are prepared if the situation arises. If your child is bullied on the bus, be sure you follow the proper chain of command. Most often, this means starting with the bus driver. But don’t be afraid to keep going up the chain of command if you feel the situation is not being taken seriously or it’s not being resolved to your liking. And if the bullying still isn’t resolved, investigate alternative transportation such as carpooling, biking, walking or a different bus route if possible. What Can the Bus Drivers and Bus Companies Do? Aside from assigned seating, bus drivers and bus companies should have a strict code of conduct that specifically outlines what is expected of students on the bus and what will not be tolerated. For example, if students are required to follow a specific set of rules such as staying in seats, keeping their hands and feet to themselves and not leaning over seats to bother or talk to another person, then this will reduce the likelihood of bullying. Bus companies also should consider installing cameras if they have not done so already. Doing so allows companies to not only monitor activity, but also follow up on complaints lodged by parents and students. When a bullying incident is confirmed, it’s important that bus drivers and bus companies respond immediately. There should be a set plan of action in place for how to handle various types of bullying incidents. For instance, calling another person names or taunting them in some way results in being written up and sent to the principal’s office. The second offense and the student is removed from the bus for the day and so on. Meanwhile, a student who is caught physically bullying another student or threatening violence in any way should be removed from the bus on the first offense for a set period of days. If the behavior continues, then the student is not permitted to ride the bus for the rest of the year. The important thing is that bullying is never ignored. Even taunting, teasing, and name-calling should be addressed. The goal should be that students are calm and respectful on the bus so that the driver can get everyone to and from school safely. Some school districts consider the school bus a separate entity from the school and often encourage parents to take bullying complaints directly to the bus company. But recent legislation like the Jessica Logan Act in Ohio is making bullying on the bus the responsibility of the school. If you’re like most parents, you probably view the school bus as an extension of the school. As a result, you probably believe that the responsibility to discipline students for bullying rests with the principal. And many anti-bullying advocates agree with you. Even if your school does refer you to the bus company, be sure your school’s principal knows what is happening. Most administrators realize that bullying is greatly deterred when a bully knows there will be consequences for his behavior. As a result, when bullies realize they have to face the principal when they get off the bus, they may think twice about bullying someone again.